Forgiveness is the necessary condition for finding the peace of God. More than this, given forgiveness there must be peace. The Peace Mosaic, set to be presented to the global community on September 21, 2012 (United Nations International Day of Peace), is an ever-expanding, visually stunning, vibrantly colorful collage, comprising thousands of four-inch square pieces of card or other material on which are written, drawn, painted or glued individual pledges for peace, made by ordinary men women and children from all over the world. 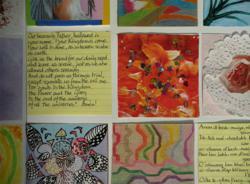 Nancy Reid invites everyone to participate in creating the Peace Mosaic. And emphasizes that “The sole requirement for participation is a sincere desire for peace.” Reid particularly encourages intending participants to watch the Peace Mosaic video. With its haunting melody, deeply moving prayers, and beautiful images, the Peace Mosaic video has already garnered a substantial internet following, and is inspiring peace pledges from all over the world. The video, extensively shared on social networks, can be seen and downloaded on both the Peace Mosaic website, (http://www.peacemosaic.org), and on the official website of International Forgiveness Week and Weekend of Perfect Peace http://www.forgivenessweek.org/videos/peacemosaic.php. It is also available on YouTube. Everyone, anywhere in the world is invited to add to the Peace Mosaic with a pledge for Peace. More details can be found on the video and on http://www.forgivenessweek.org/peacemosaic.php. The Peace Mosaic will be presented to the global community in a special ceremony on September 21, the United Nations International day of Peace.